Travelling to every corner of the globe, in a career spanning 968 Royal and Official visits, she played a leading role in some of the defining moments of recent history. To Her Majesty The Queen and the Royal Family, Britannia proved to be the perfect Royal residence for glittering state visits, official receptions, royal honeymoons and relaxing family holidays. So as you can imagine this unique vessel has a fascinating story to tell. And now that she has made Edinburgh's historic port of Leith her final home you can discover Britannia's history. 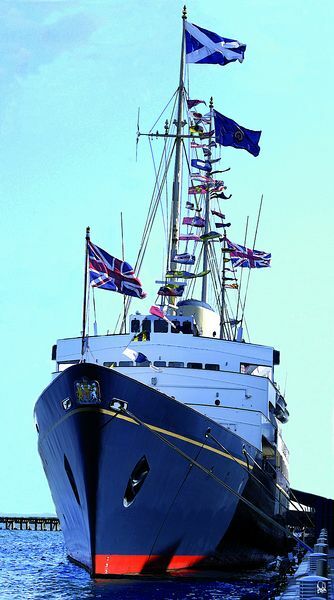 Launched on the 16th April 1953 at John Brown's Shipyard in Clydebank, the Royal Yacht Britannia continued an unbroken tradition of Royal Yachts stretching back 300 years, to the reign of Charles II. Enjoy some of the wonderful photographs taken of all generations of the Royal Family on Britannia, many of which have never previously been on public display. The Wheelhouse, originally situated on the deck below the Bridge, is now reconstructed in the Visitor Centre. Then step aboard Britannia for a self-led audio tour which takes you around five decks giving a unique insight in to what life was like for the Royal Family, Officers and Yachtsmen. You start the tour at the top of the Yacht, standing on the very spot from where Britannia's Captains guided her around the globe. The Sun Lounge on the Verandah deck was a private place for the Royal Family. Strictly off limits until now. Visit the spacious and relaxing quarters where the Admiral worked, entertained and often ate during his time on board. Relaxed and peaceful, each of The Royal Apartments brings back memories of another time. This is the largest and grandest room on board, where some of the world's most famous and powerful figures have dined with Her Majesty The Queen. 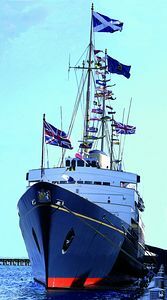 The Royal Barge is the vessel in which the Queen and Duke of Edinburgh would travel ashore when Britannia was anchored in harbours around the world. This elegant white panelled room was the Warrant Officers' and Chief Petty Officers' Mess. Visit the ship's Sick Bay and adjoining Operating Theatre with their original 1950s fittings. Britannia was the only ship in the Royal Navy to have a laundry permanently manned by her own crew. Your tour ends with the spectacular Engine Room, still gleaming as it did throughout its active life. After your tour, you can visit the Royal Yacht Britanni's shop where you can choose from a fine selecton of exclusive and quality giftwear. First admission 10.00am. - Last admission 3.30pm. First admission 10.00am. - Last admission 4.00pm. First admission 9.30am. - Last admission 4.30pm. Senior Citizen (60+)/Student in full time education £11.50. Discounts available for pre-booked groups of 15 or more when they call 0131 555 8800 (Mon to Fri). Follow signs to Leith and North Edinburgh and then follow brown tourist signs to The Royal Yacht Britannia. Catch Lothian Bus 22 from Princes Street or the Majestic Tour Bus from Waverley Bridge. We are 15 minutes drive from the City Centre.